Combine quinoa, vegetable broth, orange rind and juice in a saucepan and bring to a boil. Reduce heat to low; cover and cook for about 15 minutes or until liquid is absorbed and quinoa is tender. Fluff into a large bowl; keep warm. In a large nonstick skillet, heat oil over medium heat. Cook onion and garlic for 3 minutes or until softened. 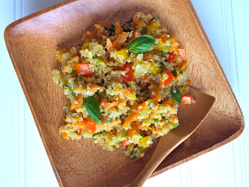 Stir in carrot, zucchini, red and yellow peppers and cook for 5 minutes or until tender crisp. Add pepper. Stir into quinoa mixture with basil. Prep Time: 15 min. Cook Time: 25 min. Servings: 4-6 Source: www.heartandstroke.com (recipe developed by Emily Richards, PH Ec. ).